Limit the number of users. Create a registration number that expires on a certain date. Create a registration number that is keyed to a specific computer name. 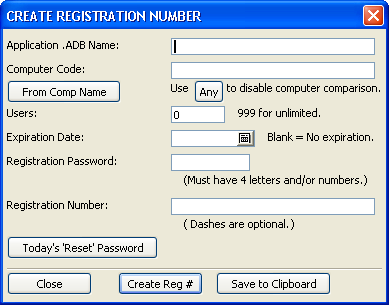 Since this addin was built for general distribution to developers, a password is required to build the registration numbers. You set the password yourself so that nobody else can build a registration number for your application without the password. The Addin also includes a free bonus routine that can be used to store the actual data path (master path) in the registry of each workstation each time the application runs. The "datapath" can be retrieved from the registry by many 3rd party installation routines (not Alpha's built-in install maker) to determine where the actual data files are located even if installing an update from a shadowed workstation. This eliminates the need to go to the server to install updates and even eliminates the need for the user to actually locate the correct folder. This routine also saves various 'last used' dates that indicate access from a runtime version of A5, full version, shadowed folder, or the main folder. These dates can sometime be helpful for troubleshooting certain issues. Due to the security issues related to this addin, please contact us for more information.